Although the idea of fact versus fiction is often used to imply that fact is real whereas fiction is merely made up, Ulrike Altmann and her colleagues (2014) present a deeper study of the issue. Twenty-four participants were asked to enter a functional Magnetic Resonance Imaging machine, and read on a computer screen 80 short narrative stories, with a mean length of 48 words. Half the stories dealt with negative emotional content, and half with neutral content, and (orthogonally) half the stories were labelled randomly as factual and the other half as fictional. Participants were shown the factual or fictional label for three seconds before each story was presented. (The design was a 2 x 2 repeated-measures analysis of variance.) After reading each story, participants answered a question about the story, and also indicated whether it was factual or fictional. Participants also completed Davis’s (1983) Interpersonal Reactivity Index. When participants read a story as factual, activation occurred in action-based areas of the brain, including the premotor cortex and cerebellum, which may be parts of the mirror neuron system. This suggests a reconstruction of events based on actions. By contrast, when participants read a story as fictional, brain activation occurred in areas such as the anterior cingulate cortex and the prefrontal cortex. These areas are thought to be more concerned with emotion, and with construction of simulations of what might have happened, or what could happen. They have been associated with empathy and understanding other people. Participants' reaction times to answer the question about the story were shorter for the stories labelled as factual than for those labelled as fictional. When reading a story labelled as fictional (as compared with one labelled as factual) the higher participants’ scores were on the Fantasy scale of Davis’s Interpersonal Reactivity Index, the more activation was seen in the medial prefrontal cortex (see the graph above). The implication is that this brain area was involved when readers put themselves into the situations of fictional characters. Whereas reading about factual events is about relating the readers to actions in the real world, reading fiction invites simulation and imagination, perhaps including what is going on in other people’s minds. This study can usefully be related that of Marcus Appel and Barbara Maleckar (2012, which we reported in OnFiction on 11 February, 2013, click here) in which they found that people were more easily transported into stories presented as factual or fictional than they were into stories presented as fake—apparently factual but untrue. Altogether, then, for narrative stories three different modes of reading are available, each indicated by information outside the text (paratextual information), for instance about the source of the story. When a story is presented as news, for instance in a newspaper, we tend to read for the facts of what has happened. When a text has been presented as true but is announced to be false, we read the story as fake. When we read a novel or fictional short story, we are invited to create a simulation of possible circumstances, or of a characters in possible worlds. Altmann, U., Bohrn, I. C., Lubrich, O., Menninghaus, W., & Jacobs, A. M. (2014). Fact vs fiction—how paratextual information shapes our reading process. Social Cognitive and Affective Neuroscience, 9, 22-29. Appel, M., & Maleckar, B. (2012). The influence of paratext on narrative persuasion: Fact, fiction, or fake? Human Communication Research, 38, 459-484. 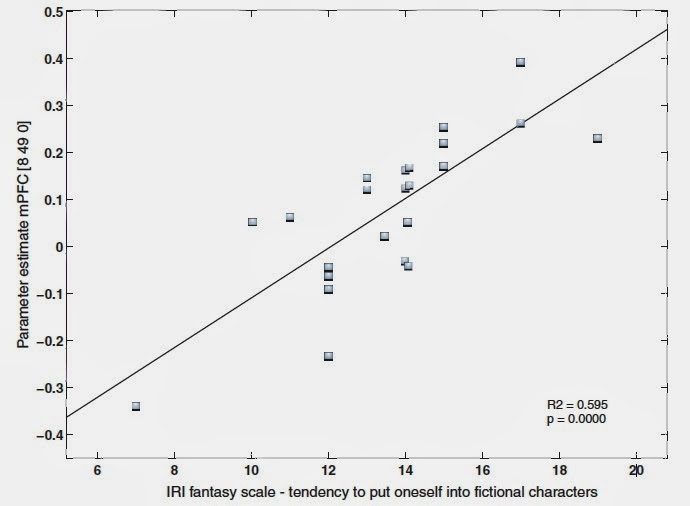 The image is Figure 2 of Altmann et al.’s article showing the relationship between participants’ scores on the Fantasy scale of Davis’s Interpersonal Reactivity Index and activation of the medial prefrontal cortex (x-axis) when reading a story presented as fictional as compared to factual.